All the major stats and numbers recorded during a high-scoring thriller in Mumbai. Once again the middle overs led to defeat for the Mumbai Indians (MI) who failed to get going after a dream start from their opening pair. The home team scored only 78 runs between the 7th and 16th overs while the Rajasthan Royals got 105 runs in the same period. Jos Buttler nearly finished the chase by virtue of the 28-run over against Alzarri Joseph. But the Royals’ middle-order crumbled yet again as they scored 27/4 in five overs after his dismissal. However, the required runs were too less for the Mumbai team to garner two points. The Mumbai Indians are yet to defeat the Rajasthan Royals since their comeback in the previous season. Both the teams faced off in three games since the previous season and won all the three wins while chasing. Krishnappa Gowtham, Jos Buttler and now Shreyas Gopal have hit the winning runs in all those three games; that too against Hardik Pandya only. Interestingly, all the three players were part of Mumbai Indians squad that won the IPL for the 3rd time in the 2017 season. 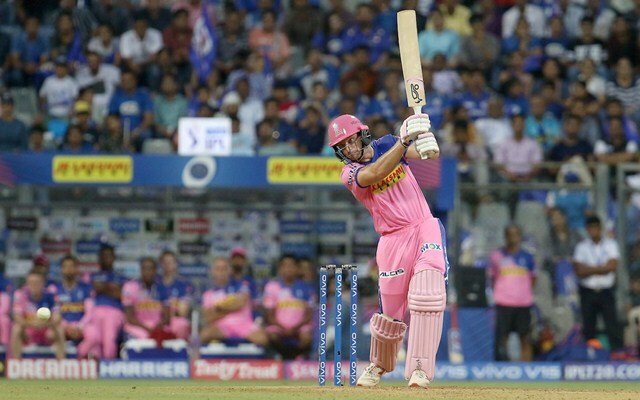 By playing against the Rajasthan Royals in today’s game, Mumbai Indians became the first team in the Twenty20 format to feature in 200 matches. Before this game, they were tied with England domestic team Somerset with 199 matches. During the 2017 IPL season, MI became the first team to win 100 Twenty20 matches. Yesterday’s game against RR was Rohit Sharma’s 100th Twenty20 as the captain of the Mumbai Indians. Not often teams have chased big targets in the IPL against the Mumbai Indians. However, the top two successful chases against them in the league have been recorded in the last two seasons. The Delhi Daredevils (now Delhi Capitals) successfully chased down 195 on the last ball during the previous edition. The Rajasthan Royals’ chase of 188 now stands at second place in the biggest IPL chases vs MI. Both these games were played at the Wankhede Stadium in Mumbai that too in the evening. An even more interesting relationship between the two matches is that they were played during ESA Day. The Mumbai Indians reserve a 4 PM home game every season for their ‘Education for All’ initiative. The Education and Sports for All (ESA) Day would witness 20k children lending their support to the Mumbai-based franchise from the stands.